"The Tiara Has Become a Social Need"
It was not long ago that a woman went to a metropolis from her country home to spend a night in a hotel. She brought her jewel box with her, and a clever hotel thief got away with her tiara. To this day she has never got the jewels back, and there are persons heartless enough to say that a woman who could not spend a night in town without her tiara deserved to lose it. They do not understand the importance that this form of jewelry has assumed. In explaining why she had come to town for twenty-four hours with such a valuable ornament, the victim of the thief called on English precedent and quoted a duchess, who said she would as soon go about now without her tiara as without her toothbrushes. The ring of tiaras in the so-called golden horseshoe of the Metropolitan Opera House in New York bears witness to the importance that this form of headdress bears to wealth and social distinction. The outward and visible sign of a certain material condition is the tiara. 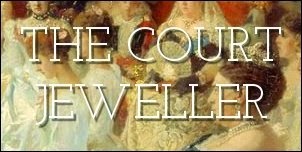 In England, the duchesses have had them for years, and the wealthy intruders, whether they come from Australia or South Africa, immediately concern themselves about the style of their tiaras. In the large cities, the show girl or the actress who has acquired fame wants first of all a tiara. The crown of diamonds and pearls that rests on the brow of Miss Gilman  will undoubtedly make its appearance in rivalry with other tiaras once an impending social event takes place. This tiara was made by the most famous jeweler of the Avenue de l'Opera and is classical in the purity of its outlines. It follows exactly the form of a princess's crown, and the younger women of the royal family in Germany, Russia, and England top their charms with such an adornment once they have reached an age in which the tiara is permissible. These crowns are not for the young women of the sort of society that understands their purpose. it is the dowager who has the first call. Young girls not yet married are allowed to enjoy the tiara only in a discreet form shown. A thin band of gold and jewels -- preferably not diamonds -- with the mitigation of an aigrette -- is the most ambitious form that any young woman with an idea to the fitness of things would aspire to. The English crown worn by Ellis Jeffreys  is the fashion most popular now in London when the wearer is not going to an impressive social function. These tiaras are made with not more than three points, which are sometimes in the form of stars. 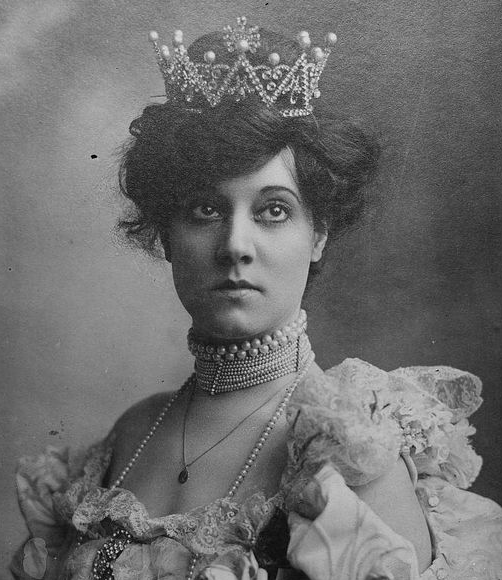 Mrs. Titus of New York has a diamond tiara composed wholly of five stars. The center star, which sits over the forehead, is the largest, and the four others decline gradually in size until the two at each end are not more than two inches in diameter. The central star, however, measures three inches from point to point. These are the tiaras which are appropriate, according to the modes imported from London, for dinners, for a box in the theater, and above all, for rather young matrons on all occasions. Dowagers who have passed beyond a certain age would never be content with such a slight jeweled decoration in the hair, for when they wear a crown it is imperative that it have a certain weight and value. A well-known matron wears on state occasions a wonderful tiara of diamonds and pear-shaped pearls. The diamonds are arranged in two circles of large stones with a grilling of smaller gems forming a connecting network between them. Twelve large pear-shaped pearls rise from the top band of diamonds. The same treatment of pearls is seen in the tiara of Mme. Boninsegna , which is heavier in appearance and characteristic of the exotic taste of the Southern craftsmen. 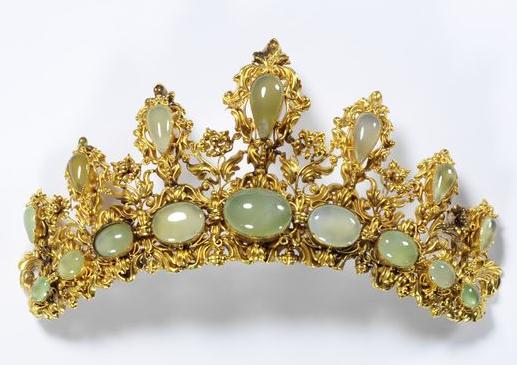 This tiara, which was made in Rome after one worn occasionally by the Dowager Queen Margherita, shows the Italian love of sumptuousness and impressiveness at the cost of grace and lightness. Such a headdress would, of course, be impossible except on a most formal occasion. The woman who appeared at dinner with such a structure on the top of her head would embarrass the waiters as well as the guests. The pictures of the court beauties of Italy show many of them attired with just such massive and magnificent tiaras. It is said that Elena, the present queen, has made the most emphatic protest possible against this ornate fashion by always assuming on festal occasions a very narrow coronet, which is in form very much like that worn by Miss Jeffreys. It seems to be an unwritten rule that tiaras should be of diamonds, although there is no stone so trying to women not in the first blush of youth. A massive crown of flashing brilliants on any woman's head will absorb all the brightness from her own eyes, making them look old and dull in contrast. It is for that reason that Sarah Bernhardt long ago gave up diamonds for other stones. Women who wear tiaras in this country do it, of course, with no idea of their political significance, while in Europe it is necessary in private life to avoid the pointed crown, which indicates rank, whether it be the five points of the countess or the nine points of a princess. Such precautions are not necessary in this country, and women take any shape which they can afford or which is becoming to them. It was this freedom in selection that led a foreigner to express his astonishment at a large ball given recently in New York. "How does it happen," he asked, surprised at the number of nine-pointed coronets, "that there are only princesses here in the United States?" The semi-precious stones that have recently come to be used so generally are popular for headdresses now, and a tiara of them may be bought for less than $500, whereas a diamond tiara may cost from $100,000 to three times as much. These stones afford very attractive combinations of color. Thus the coral tiara made of the pink stones which is worn by a society woman with prematurely gray hair is more appropriate than anything else she could put on. In the same way, tiaras of turquoise and topaz are very becoming to women who are very blond or very brunette. These semi-precious stones are usually set in very light designs, with no effort to give the look of solidity usually sought in the diamond tiaras of the finest kind. Another new style popular this season for the first time is the enamel tiara, made in imitation of flowers and leaves. They are for the most part low and compact, having the appearance of flowers entwined so as to make a wreath for the hair. They are usually much smaller than the size of the real flower or leaf, and are sometimes finished with diamonds and other stones. The ornamentation of the stones is slight, however, as the prevailing intent of the design is to imitate nature. These enamel tiaras sometimes reach $200 in price. 1. Mabelle Gilman (ca.1874-1966) was an American stage actress who married William Ellis Corey, the president of U.S. Steel, in 1907. Later in life, Mabelle was linked with Prince Luis of Orleans-Bourbon. 2. Ellis Jeffreys (1868-1943) was an English film and stage actress. She was married to the Hon. Frederick Graham Curzon, son of the 3rd Earl Howe, from 1894 to 1903. 3. Celestina Boninsegna (1877-1947) was an Italian soprano who was best known for singing Verdi's heroines in opera houses around the world.